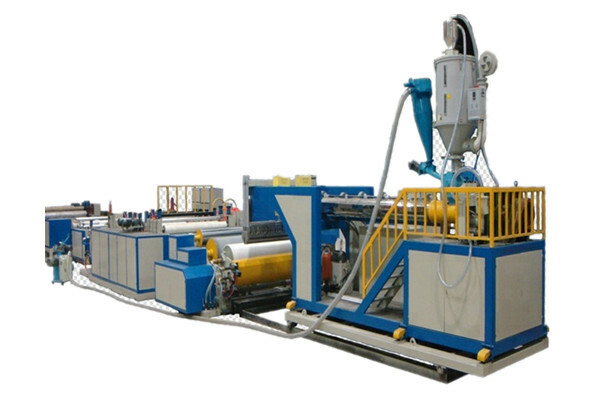 This machine can cast PE, PP, EVA, PEVA, TPU films which are widely used for hygiene, medical and packaging applications. The cast film machine has some advantages compared with blown film machine. It can be widely applied in the area of hygiene products, daily necessities and packaging. Here are some examples: sanitary napkin, lady pad, baby diaper, raincoat, umbrella, tablecloth, computer cover, electric allplian cover, shoes cover, etc. Our technical team has rich experience and strong executive ability, and the equipments developed by the technical team are with table and reliable quality, excellent index and high flexibility, have been obtained wide recognition and high praise from the users.The machine can produce all kinds of packaging film, deep-embossed film, sanitary napkin PE base film, diaper base film, and various kinds of medical hygiene film. If the special stretching unit of this machine is started, breathable waterproof film can be produced by this machine. If you have any question about this line, please contact us directly. We will reply you as soon as possible. We are willing to take you to visit the factory. Looking for ideal Casting Film Machine Manufacturer & supplier ? We have a wide selection at great prices to help you get creative. All the Waterproof Film Machine are quality guaranteed. We are China Origin Factory of Breathable Cast Film Machine. If you have any question, please feel free to contact us.